If you haven’t heard, it’s hot here in Texas. So given the weather and the fact I stumbled up on this fun sounding recipe in an old brand name recipes book, here’s a recipe for Cream of Coconut Pie. The original version came from the folks who make Coco Casa brand cream of coconut, but I updated it by using the microwave and Coco Lopez. The Lopez worked perfectly. As far as easy and good coconut pies go, this one is up there with the best. It’s especially nice for novice cooks because it doesn’t involve making a custard. Plus, the only step that involves an oven is toasting the coconut, and that is optional. Prepare the crust if you haven’t done so and have it ready to be filled. In a big, microwave-safe bowl, combine the cream of coconut, milk and marshmallows. Stir it all together, coating the mallows with the cream of coconut mixture. Microwave on high, stirring every 30 seconds, until the marshmallows are melted and the mixture is smooth. Put the whole bowl in the refrigerator for 1 hour to thicken. After 1 hour, whip all the cream and set it aside. With a hand-held or stand mixer, beat the now-slightly-thicker coconut mixture for about a minute or until it’s lightened (it won’t be fluffy at this point). Fold in all the whipping cream, then fold in just 1 cup of the coconut. Pile it all in the pie crust and chill for 2-3 hours. In the meantime, toast the remaining coconut by laying it on a parchment or foil lined cookie sheet and baking at 350 for about 8 minutes. 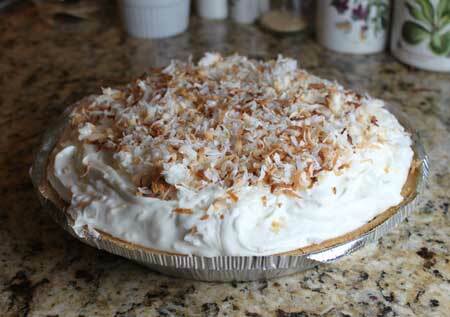 Sprinkle cooled, toasted coconut over the pie. I lost this recipe years ago and could never find it. It is soo delicious!! So glad I found it again. Thank you!!! My husband will be so happy. Thanks for the yummy recipes! I just made the coconut cream pie and S’mores brownies and they were gobbled up quite quickly. Everyone was asking for the recipe! Thanks again! You can always cut the sweetness by using more unsweetened cream. There’s enough gelatin in the marshmallows to keep it firm and since whipped cream itself is pretty stiff, adding more cream will temper the perceived sweetness. Likewise, if you try to use less cream you’ll get a sweeter pie. I made this a few days ago. I used a homemade pie crust and definitely needed a 9.5 inch pie pan to hold all the filling. The pie is good, but VERY sweet. I liked the melted marshmallow concept, which I had never tried in a pie. Makes sense, with the gelatin from the marshmallows firming up the filling. Thanks for the recipe. Thanks for the review, Mindy! I made this pie tonight at my in-laws. It was super easy and so good! Thanks for sharing it. Hi Andrea! Thanks for reviewing the pie. I’m glad your guests liked it. 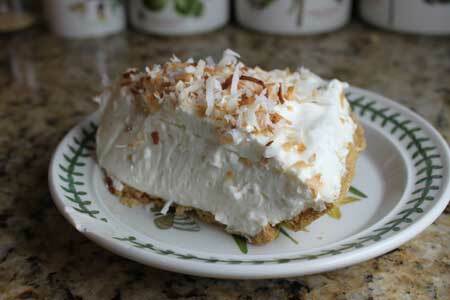 Todd says it was among his all-time favorites, and I’ve made a lot of coconut cream pie. Made this pie for a dinner party last night – it was as easy as promised and more importantly, it was a big hit with my guests. Thanks! Love the photo of Hal at the sprinkler head. 🙂 I really need to make a coconut cream pie for my husband. I say it every time you post a recipe for it… still haven’t done it. Poor guy! Yum! Perfect for the weather! hahahahaha, what a great shot of Hal. Thank you, Anna, I needed that cute laugh this morning for sure. And…THUNK! That’s my forehead meeting the desk at those pie pics, yowza! Only 3 cups whipping cream, hee? DH loves all things coconut, me not so much, will have to buck up and fix this for him. 3 cups, you say? Think of you every Friday night when we watch FNL, can’t believe it’ll be gone very soon. Miss you at the CLBB. This looks light and delicious….a perfect summer dessert! I have tried toasting coconut many ways: Oven, microwave, toaster oven. Does anyone get a noxious-smelling fume when toasting it in the oven? I can’t figure out what that is. But my latest (and so far, favorite) way is to toast it in a non-stick skillet over a burner on the stove. Just put the coconut over a low-medium flame & stir it frequently. This looks fantastic! I love coconut! The pie looks de-lish. I just recently made whipped cream with coconut cream. Good stuff. Three cups of whipping cream? Clue #1 that it will be delicious. 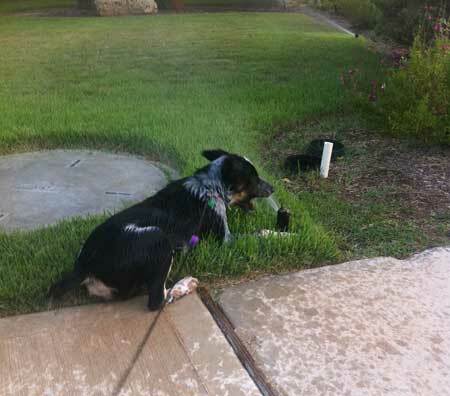 Dogs love their sprinklers! Our 85lb Great Pyr thinks it is a great game as one goes off another comes on! Attractive pie. HAL looks like he’s fitting into the family well. So cute! Nothing like a sprinkler on a hot day. This pie sounds really good.